Part film night, part concert, Debt Records invites you to the launch of T.E. Yates‘ new animated music video with live sets from Alabaster dePlume, James G. Wilson and Yates himself (plus band) with DJ Rub The Sleep Out expertly filling in the gaps. The price of entry is £5 on the door. 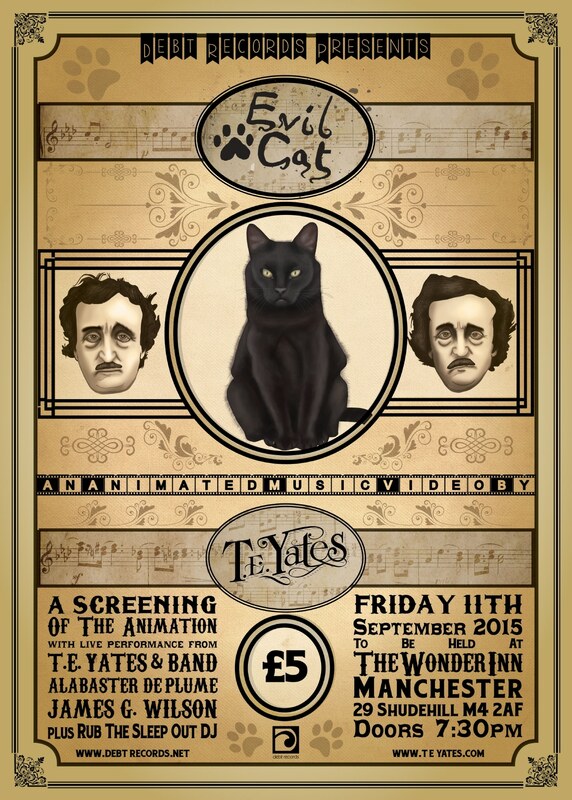 Yates will be joined by a seven piece band on the night for a special performance to celebrate the release of the animation. Also performing are Debt Records’ very own Alabaster dePlume and Yates’ regular guitarist James G. Wilson. Regular Big Hands DJ Rub The Sleep Out will be picking tunes on the night. Entry is priced at £5 on the door. The event begins at 7:30. It is to be held at The Wonder Inn, 29 Shudehill, Manchester, M4 2AF. A raffle will be held for paying entrants – the prizes shall be framed original artwork from the animation. A Facebook event page has been created here.